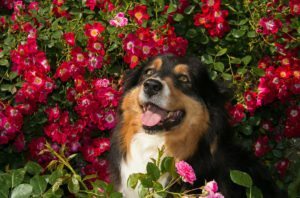 They may be beautiful to look at and fill your garden with fragrance but there are many plants that are poisonous to pets. The flame lily, the perfumed Yesterday, Today and Tomorrow, Elephant Ear, syringa and cycads all pose significant dangers to dogs and cats. 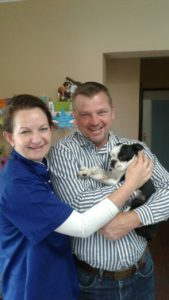 At our Country Animal Clinic we recently saw Diesel Bensch, a 5-month-old Boston Terrier who had become ill a week earlier. He was not responding to treatment. His owner thought he might have chewed on an aloe plant in the garden. The dog was really ill and weak when he arrived. I did an abdominal ultrasound scan. His stomach was severely distended with food and fluid. Pieces of ‘foreign material’ obstructed the outflow to the small intestines. He also had high liver values on the blood tests. I advised exploratory surgery. During the surgery I removed 3 pieces of fibrous plant material from his stomach that was causing the obstruction. He responded very well to treatment and was gobbling down his food by the next morning. We discussed the garden plants that are toxic to dogs and Diesel’s owners, Riaan and Crizelle Bensch, mentioned that they have a cycad (broodboom) in their garden. This explained the fibrous material and the elevated liver values! 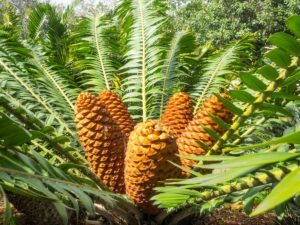 Cycads are extremely poisonous to dogs, especially the seeds. The seed kernels in the ripe female cones cause severe liver damage and are considered carcinogenic. Even a few seeds can kill a dog. Fortunately for Diesel, he made a full recovery and went home 2 days later. If you suspect your dog or cat has ingested a plant, consult your veterinarian immediately. The sooner you act, the better his chances of a full recovery. Spring flowers with bulbs, like tulips, daffodils, Narcissus, and hyacinths, can be particularly dangerous to dogs, especially the skin at the bottom of the bulb, says Dr Justine Lee, emergency veterinary specialist. Whether they dig them up from a garden or snack on some bulbs waiting to be planted, ingesting these flowers in large amounts can cause nausea, vomiting, and diahorrea. More severe symptoms as a result of larger ingestions can include increased heart and respiratory rate, foreign body obstructions, and, in rare cases, cardiac arrhythmias. Lilies, tiger, day, Easter, stargazer, red, and wood are highly toxic to cats. The pollen, leaves, stems, and even water from the vase of tiger lilies can cause severe kidney failure in cats. Signs of lily poisoning include lethargy, vomiting, diahorrea, and seizures. Crocus plants, particularly the spring crocus, can cause gastrointestinal issues in cats including vomiting and diahorrea. While it does not cause kidney failure, lily of the valley can cause vomiting, decreased heart rate, and severe cardiac arrhythmias.